The sidewalks along our street can be a test of pedestrians' initiative. This sidewalk has been constricted since last fall, and though it doesn't affect most of us, it could make things tricky for the occasional person in an electric wheel chair heading up to the shopping center. For months, I'd think of that each time I walked this sidewalk, and each time I'd do nothing about it. I know the owner who is supposed to keep this sidewalk clear. It's usually better to knock on the door and point out the problem, which homeowners often don't notice as they come and go in their cars. But he's busy with a young kid or two, and after all, it took me a few years living up the street before it dawned on me that my portion of sidewalk was partially obstructed by shrubs. Finally, I went ahead and shoveled the leaves off the sidewalk. Fifteen minutes of exercise is not to be regretted, and this newly cleared stretch has now gained positive associations to replace those pesky concerns--a victory for self and community. Here's another recurrent obstruction, across the street. Most of the bamboo stems returned to vertical after the storm, but one stem remained hanging over the sidewalk for days. Rather than intervene, I made it into an experiment, a test of citizenship and community spirit, to see whether any pedestrian would actually take the initiative and break the stem off, to solve this annoying problem in a small corner of Princeton's commons. Several days passed, with each pedestrian walking around it, before one finally took a few seconds of extra time to pin it back where it wouldn't obstruct those that followed. For virtual nature walks identifying the diverse intrusive foliage along blocked Princeton sidewalks, see A Portrait of Sidewalk Neglect and a Weedful, Needful Sidewalk. Here's a Sustainable Princeton event coming up tomorrow. One of the speakers is with TerraCycle. I'm going to take my burgeoning bag of mylar coffee bags to see if they will put them to reuse. Join us tomorrow evening at 7:00 p.m. at the Princeton Public Library Community Room for our panel of local circular economy experts moderated by Dylan Siegler, Sustainability Coordinator at NRG Energy, Inc. Panelists Charlene Wall-Warren, Director Sustainability at BASF; Michael Waas, Global VP of Brand Partnerships at TerraCycle and Matt Wasserman, VP New Product Development & Sustainability, Sabert Corp. will discuss how companies are rethinking the linear "take, make, dispose" economy and moving towards a system that seeks to reduce pollution and the amount of waste we produce. New Jersey Certified Recycling Professionals can earn 1.5 CRP classroom credit for attendance. Light snacks and refreshments provided by Jammin' Crêpes. This zero-waste event is free and open to the public. Many thanks to our longtime event partner, The Princeton Public Library and our series sponsor, NRG Energy, Inc. The other day, riding my bike southward on Vandeventer at a goodly rate and in the approved manner, I heard a honk, and glanced back to see a car following close behind. With parked cars on the right, I had no room to move out of his way, and so proceeded apace. To my astonishment, he pulled closer, within two feet of my bike, in an effort to intimidate. I didn't know what to do. Finally, he veered out into the opposite lane and passed in a huff. All this haste came to nothing, as moments later he was forced to stop and wait like everyone else for the traffic light at Nassau Street. Noting his captive presence in the line, I approached and tippy tapped ever so discreetly upon his window and inquired in the politest, most diplomatic tone I could summon--my memory is a bit unclear as to the exact language used--something to the effect of, "Whatever do you think you are doing?" I continued in a similar manner until fully vented, doing my best at all times to maintain a gentlemanly demeanor, though word choice and intensity may have been influenced by an awareness of having just been bullied. Then, gaining no response other than an averted eye, I went on my way, confident that my thoughtful, nuanced feedback would steer him towards deep reflection and a changed behavior going forward. In the first in a series of civic action workshops at Labyrinth Books, Cymie Payne will be teaching anyone who wants to learn how to write and submit what are called "letters of comment" when objectionable policy changes (the focus here is on the environment) are looming. With the advent of a new administration in Washington, thoughts turn to the nature of democracy. Do you feel like your government isn’t listening to you? Do you want your opinion to be heard? Do you have expertise that would improve public policy? The legitimacy of democracy rests on transparency and public participation. We have the right to know what our government is doing and frequently the law provides means for us to speak directly on policy and regulation in a process known as “commenting”. Federal agencies are obligated to acknowledge these public comments. Come participate in a practical introduction to a simple process for commenting on regulations, policies and decisions. No prior knowledge required. Cymie Payne is an Associate Professor in the Department of Human Ecology at Rutgers University and the School of Law. She is known for her work on global governance of the environment and natural resources and the consequent evolution of international law, with a focus on climate change, ocean resources and protection of the environment in relation to armed conflict. She also is affiliated with the Bloustein School of Planning and Public Policy and writes frequently on international courts and tribunals. Many homeowners find it convenient to rake or blow their leaves to the curb each fall. The leaves are then scraped off the pavement and hauled out of town to be composted. There may be some logic to this approach, but there's also considerable illogic at work. The illogic plays out in many ways: expense, the hazards of blocked traffic and bike lanes, global warming gases from all the scraping, hauling and industrial composting, nutrient runoff into streams, impoverished and hardened urban soils, bias against homeowners on busy or narrow streets, and a scarred streetscape. Here are photos that illustrate some of the downsides. 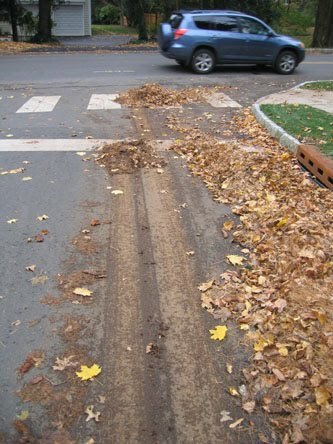 Leaf piles in the streets push bicyclists and pedestrians (on streets with no sidewalks) out into traffic lanes. I've heard of near misses, particularly at night. Cars, too, must swerve to avoid leaf piles. Here's a common situation. Police records show at least two auto accidents precipitated by leafpiles. Removal of the above leaf pile left a dirty street and scarred ground. Rains will sweep nutrients from the remaining decomposing leaves and bare dirt into the local waterway, adding to nutrient pollution. The irony is that regulations require that silt fencing be installed at construction sites to prevent the washing of sediment into our streams, and yet uncontainerized leaf collection exposes dirt and coats long stretches of streets with leaf residue that can then wash into those same streams. 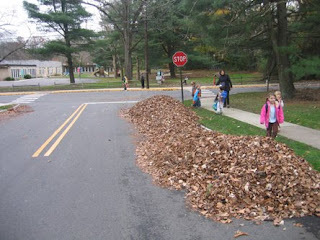 Loose leaf collection discriminates against homeowners on busy streets, where they must pile their leaves on the grass rather than the pavement. Covered by leaves, the grass quickly dies, leaving bare dirt far into the next summer. Grass also gets killed on narrow side streets like Chestnut. One exasperated resident of very narrow Bank Street told me of the racket caused by a landscape crew that blew leaves from the backyard into the street, where they interfered with traffic for many days. It's ironic to see this fertilizer sign on a lawn facing Hamilton Ave, while at the same time the lawn service is killing the grass with piles of leaves. You could ask "What are people thinking? ", but I doubt much thinking is going on. Rather, there's a blind adherence to two customs: fertilizing lawns and blowing leaves towards the street. Princeton main thoroughfare, Nassau St, should be a pride and joy, but the decorative flags and hanging flower baskets during the summer contrast with the lingering scars left behind by fall leaf pickup. Here's another stretch of Nassau Street left bare and muddy after the grass-killing leaf piles have been removed. And then there's the actual scars on the pavement, left behind by the "claw" that picks up the leaves. It's hard to photograph the annual expense, which may be up around $1 million, or the hardened, leaf-cheated urban soil that sheds rain and adds to flooding, or the fossil carbon rising from all the public works department's machines to speed climate change. Some people think that the answer lies in education and better enforcement of the town's leaf ordinance. I used to think the same. But past education efforts, of which I was a part, had negligible impact. Enforcement was tried, proved time consuming and was abandoned. Robo calls with schedule reminders have helped some, but it's doubtful that landscape crews, with rapid employee turnover and language barriers, will ever coordinate their work to conform to the town's five zone leaf pickup. Blowing leaves into the street is much like being allowed to send underground carbon up into the air as CO2 from our exhaust pipes. The legacy of all that private convenience is a shared public burden. Deprived of the convenience of doing environmental harm, we would respond, as humans do, by being resourceful and inventive. In the case of leaves, we'd mow some of the leaves back into the lawn and blow others into a back corner of the yard to kill the weeds. We'd devote a tiny portion of our (largely unused) yards to leaf corrals that return nutrients to the soil, and if need be we'd stuff any leaves left over into yardwaste bags and rollcarts for efficient pickup. We'd take as our inspiration nature itself, which never hauls valuable nutrients away, but keeps them close by, to return to the soil from which they came. And we'd take pride in clean and verdant streetscapes. Princeton doesn't need to be spending $1 million for a brand of leaf management that forces us to navigate through a scarred mess much of the year. We're better than this.